VB: Growing up in New Jersey, physical activity was always at the forefront of my daily routine. Not sure if it was just because my parents wanted to get my brother Jeff and I out of the house, but they made sure we were always involved. I remember growing up taking part in everything from karate to skateboarding to soccer; and hearing the words of my mother, “Just go outside and play.” Instead of video games and the internet, there were backyard football games and building forts in the corn fields. Play, about as simple as it gets for encouraging physical activity for our youth. In a culture that is now seeing increasing trends in childhood obesity and diabetes, I am thankful for their support and unknowingly encouraged what has lead to an active lifestyle for me professionally and personally. PC: As fitness professionals, we’re each inspired by different things. What specifically made you want to get into the strength & conditioning industry? VB: In high school, I competed in football, track, and baseball. I ran track to develop my speed on the base paths and started to lift weights primarily for football. During my junior year, I sustained a shoulder injury playing football which required me to work with our athletic trainer for rehabilitation. In thinking about a career and what I wanted to study in college, what I did know was that I wanted to stay involved with athletics and I did not want to work with physical therapy patients. After spending a lot of hours rehabbing my shoulder with our athletic trainer, I saw athletic training as a nice fit to both. Both athletic training and baseball led me to Springfield College where I was an infielder for the Pride. During my undergraduate time at Springfield, I was still very much exposed to strength training and fitness. Springfield College has a strong athletics department backed by strength and conditioning. As a baseball player, we took part in a semi structured strength and conditioning program and I took some specific classes in the field. At Boston University, the requirements and expectations are much greater on my athletes and I am proud of them for committing to the excellence that I demand of them. After my graduation in 2000, I worked as an intern athletic trainer for the New Jersey Red Dogs in the Arena Football League and was a high school athletic trainer starting the school’s first program. After 2 years in the field, I realized this is not where my heart lies and did not see myself as an athletic trainer the rest of my life. I packed my bags and headed south to Appalachian State University in North Carolina. I initially questioned the decision but knew I did not want to be an athletic trainer and that I was following a path I was more passionate about. I earned my masters degree in exercise science with a concentration in strength and conditioning in 2004. Prior to my arrival at BU, I served as the strength and conditioning intern and assistant athletic trainer for the Kane County Cougars in Geneva, IL, the Class A affiliate of the Oakland Athletics and was the strength and conditioning coach for the West squad at the 2004 Midwest League All-Star Game. Since my arrival at BU, I have worked with the National Strength and Conditioning Association Soccer/Rugby Executive Council, U.S. Soccer U14 women’s national camp, and the U.S. Field Hockey Association during their high school open camp. PC: Wow, you’ve had some incredible experiences Vic. Can you tell everyone about your day-to-day responsibilities at Boston University? 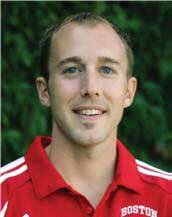 VB: I recently began my fifth year as associate strength and conditioning coach at Boston University. Currently, I am responsible for the organization, design and implementation of all aspects of the women’s basketball, women’s soccer, softball, cross country, and wrestling programs, and act as the director of strength and conditioning for swimming and diving working primarily with the mid-distance and distance swimmers. I design and implement in season and off season sport specific movement preparation, movement skills, plyometric, speed, agility, conditioning, Olympic/weight lifting, and injury prevention programs, and assess player improvements for agility, speed, acceleration, maximum strength, power, and cardiovascular fitness levels. Additionally, I assist the development of graduate assistants and interns. I am also the Head Coach of the Boston University Triathlon Team and am assistant coach for Ali Winslow Sports a triathlon and endurance coaching service located in Kenmore Square. PC: Vic, I know you’re the type to walk the walk and talk the talk when it comes to maintaining a rigorous training schedule. Can you share with my readers a bit about your own training schedule? VB: Absolutely, Paul. I am very active in the sport of triathlon competing, training and coaching. I entered the sport at ASU as a way to feed my competitiveness. My typical training schedule consists of swimming 10K, biking 250 miles, and running 40 miles per week. I enjoy competing at the half ironman distance and racing marathons in the off season. PC: Wow! That schedule would put many “fitness professionals” that I know to shame. I’m impressed you find the time to maintain such a demanding regimen. Is there anything else you can share with my readers (i.e. words of wisdom)? VB: If there is one thing that I could not live without, it would be passion. Passion and enthusiasm is what led me to strength and conditioning and are driving forces in all things I do in my life. I am passionate about everything I do. If I were not, I would not do it. I am passionate and enthusiastic about guiding and seeing my athletes improve daily, not just athletically, but as people as well. Whenever the passion and enthusiasm begins to die, then I know it will be time to move on. PC: Vic, I really want to thank you for taking the time to chat with me today. Hopefully I can check back in with you down the road to see how your career is developing. It’s been a real pleasure chatting with you and continuing to learn from you. You’ve been so helpful in answering all my questions over the last year and a half since I interned at BU. VB: My pleasure, Paul. Let’s do this again sometime.